Gaming is a part of millions of households and clinicians are finding ways to use it as a therapeutic tool. Nickolas Jordan, PhD, LMFT, has always loved video games. So it was only natural that he began to think more deeply about games and their effects on relationships once he became a marriage and family therapist. "I think it's a great thing to have an opportunity to [play games] and engage in these relationships and connect with different people from different cultures," says Jordan, an assistant professor at Appalachian State University in North Carolina. Jordan is part of a relatively small yet passionate contingent of behavioral health professionals who are either studying the role of video games in therapy or integrating such games into their own practice. These professionals don't deny that video games can have negative effects, but they are challenging their colleagues—including social workers—to see the potential of video games to provide insight into clients' environments and behaviors and create a gateway to more effective therapeutic relationships. "Video games are things that people use all the time," says Jason Steadman, PsyD, a postdoctoral fellow with Community Health Center in Connecticut. "There has to be some way that we as clinicians can use them to our advantage." If you think video games only appeal to antisocial, geeky, teenaged boys, think again. Nearly 60% of Americans play video games, and consumers spent nearly $22 billion on video games and related accessories in 2013, according to a report from the Entertainment Software Association (ESA) based on 2014 statistics. An average household owns at least one device (console, computer, or smartphone) that can be used for gaming. • The average game player is 31 years old. More than two-thirds of game players are age 18 or older, and 39% are age 36 or older. • The gender split of video game players is nearly equal—52% of gamers are male and 48% are female. • Women aged 18 or older make up 36% of the game-playing population, while boys aged 18 or younger represent only 17% of the population. The number of female video game players aged 50 or older jumped by almost one-third between 2012 and 2013. • More than 60% of video game players play with other people, either in person or online, and more than 75% of gamers play with others at least one hour a week. • Video game play is an important social tool among family and friends. Eighteen percent of gamers play with their parents, 32% play with other family members, and 14% play with a spouse or significant other. Forty-two percent of gamers play with their friends. The ESA also reports that many parents don't view video games in a negative light. Fifty-eight percent of parents whose children are gamers play with their children at least once a month. Slightly more than one-half of parents (56%) say video games have positive effects on their children. These effects include mental stimulation or education, increased social connections with friends, and more time spent interacting with family members. The ESA data come from a survey of more than 2,200 households nationwide and included input from both heads of households and the most frequent gamers in each household. More information is available at www.theesa.com. These statistics should be a wake-up call to social workers who may have outdated notions about who does and who does not play video games, says Maryalice Jordan-Marsh, PhD, an associate professor at the University of Southern California School of Social Work. "There will always be people who won't use [this type of] technology," she says. "The risk is focusing on that small population and not shifting how social work thinks to engage the people who are using technology." The amount of academic literature on video games in psychotherapy is limited, but much of it demonstrates the games' potential to foster positive clinical outcomes. Perhaps the major benefit of such games is that they help players expand their social support networks and engage with diverse groups of people. For example, one literature review (Steadman, Boska, Lee, Lim, & Nichols, 2014) cites surveys that show that people playing massively multiplayer online role-playing games range in age from teenagers to older adults—a mix that doesn't often occur naturally in real-world environments. Often, friendships in the real world begin with meeting in an online game environment (Freddolino & Blaschke, 2008). Some games help develop players' motivation and persistence in the face of failure by requiring them to advance through levels of a game, achieve goals, and overcome obstacles (Granic, Lobel, & Engels, 2014). The virtual environment of video games may also give players a safe place to practice the regulation of negative emotions such as anger, anxiety, frustration, and sadness. Game players can work out problems or try new things in the virtual world before attempting them in the real world. Beyond these general effects, video games have been developed for specific behavioral health issues and to promote mental well-being. Freddolino and Blaschke describe several of these games, including Ben's Game, a game designed for children with cancer where players destroy mutated cells and collect shields that protect them from the effects of chemotherapy, and Second Life's Support for Healing, a virtual island that hosts support groups for people struggling with issues such as depression and anxiety. European researchers (Fagundo et al., 2013) found that a video game designed to help clients with impulse control improved emotional regulation and impulsivity in a group of nine patients with bulimia nervosa. Games also have been used in the treatment of anxiety disorders, aggression, ADHD, and personality disorders (Wilkinson, Ang, & Goh, 2008). Steadman believes a primary barrier to expanded research is that clinicians who are incorporating video games into practice are not writing about it. "They're just using them and seeing how it goes," he says. Steadman himself has practical experience in using video games to achieve therapeutic breakthroughs with clients. In one case, the game Spore helped foster communication with a 12-year-old boy struggling to adapt to his parents' recent divorce. Spore allows players to create virtual creatures and change the creatures' body shape and appearance. The client used the game to create creatures representing his family members and then was asked to explain his choices. The exercise allowed the client to work out his thoughts and feelings about a negative situation using an activity he enjoyed. Tasha Holland-Kornegay, PhD, LPC, a therapist in Raleigh, North Carolina, has used video games to improve therapeutic relationships with her younger clients. She often makes home visits during her work and will join in video game play to build rapport and give clients the opportunity to explain their world in a way that isn't threatening. In many cases, clients don't even realize that they are going through a therapy session because they're having fun, Holland-Kornegay says. And parents watching the exchange can see how video games can be used in a positive way. "The video game is no longer a babysitter but a tool for communication and behavior modification," Holland-Kornegay says. Using video games in clinical practice doesn't mean a therapist has to figure out how to artificially force game play into a therapy session. Instead, video games can be an add-on tool that is available to be used as appropriate, says T. Atilla Ceranoglu, MD, a child and adolescent psychiatrist with Massachusetts General Hospital in Boston. Ceranoglu has a video game console in his therapy room but only uses it if a client mentions it and indicates a desire to play. "It's there in the same capacity as my board games or a set of crayons or construction paper," he says. And clinicians don't need to be video game wizards to use them in practice. Even taking time to ask clients about whether they play video games, what games they play, how long they play, or with whom they play can elicit useful information about the clients' states of mind, family lives, and behavior patterns, as well as provide clues as to what interventions might be most effective, Jordan says. "You start there, by including it in the conversation. You don't need to do anything big," he says. "You never know what you're going to find." Yet, despite these success stories and the ubiquity of video games in American society, these games' potential as a clinical tool has been largely ignored by social workers and other behavioral health professionals. There are notable exceptions, such as Mike Langlois, LICSW, a Massachusetts social worker well-known as a gamer-affirmative therapist, but these exceptions are few and far between. There are several factors in play with this disconnect, observers say. Media portrayals of video games as antisocial and violence-provoking are so pervasive that clinicians are wary to use these games, let alone endorse them. In addition, many clinicians are older and feel more comfortable using tools of their youth—such as board games—instead of video games. Ignorance about video games and the gamer culture are also a barrier. For social work in particular, the reasons may go even deeper. The hesitation over video games is just another example of how the profession seems to lag behind in acceptance of new technology. Social work's fears about and sometimes open disdain of technological advances prevent their benefits from being fully realized and puts the profession in danger of becoming irrelevant in a digital world, says Nancy J. Smyth, PhD, LCSW, dean of the University at Buffalo School of Social Work. A self-proclaimed tech geek, Smyth has created a blog called Virtual Connections that explores the impact of technology on social work and the people it serves. "You'll hear social workers say that they don't use technology because they're all about relationships," she says. "We need to realize that technology and relationships aren't separate things." Changing negative perceptions about video games begins with education, says Rebeca Chow, MA, LPC, LCPC, RPT/S, an assistant professor and play therapy program coordinator at MidAmerica Nazarene University in Kansas. Just as with any other therapeutic tool or approach, behavioral health professionals should not rush into using video games but instead should take time to learn about how they might contribute to effective clinical practice, she says. "I don't just grab a technique and go with it," Chow says. "I try it several times and make sure it works and that I'm comfortable with it." Social work students and practitioners need more access to classes and continuing education activities about emerging technologies such as video games, says Langlois, author of Reset: Video Games & Psychotherapy. 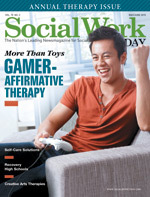 Social workers also need to play video games to get a better sense of what their clients enjoy about them. "It's not up to our clients to always be educating us about these things; we need to explore on our own," Langlois wrote in an e-mail to Social Work Today. Langlois' website (gamertherapist.com) and YouTube channel provide resources social workers can use to become more knowledgeable about how to practice in a way that affirms gamers rather than pathologizes them. For example, Langlois explains in one video how clinicians can make their offices feel more welcoming to gamers by including gaming magazines in their waiting rooms and having portable gaming devices on hand for clients to use. Clinicians who are skeptical about video games should step back and consider their own gaming behavior and the benefits they derive from it, Jordan says. Many mental health professionals who criticize video games don't realize that playing solitaire on a computer or Angry Birds on a phone makes them gamers just as much as a people playing games such as Minecraft and Call of Duty. "The label of 'gamer' applies to more people than you think," Jordan says. Smyth asks social workers and other behavioral health professionals to put things in perspective. Technologies such as telephones and televisions elicited negative reactions when they were first introduced, but were soon accepted when their positive potential to foster communication and education was recognized. Video games fall into a similar category. Jordan puts it more bluntly. "It's going to be fine," he says. "Everyone should just relax." Maryalice Jordan-Marsh, PhD, an associate professor at the University of Southern California School of Social Work, is part of a team that has turned to the virtual world of gaming to help long-term wheelchair users battle shoulder pain and gain upper-body strength. Skyfarer is a mixed-reality exercise game for individuals aging with a disability. The game combines a virtual environment with a rig equipped with technology that detects movement of free weights or exercise bands. The rig is adjustable for a variety of types of manual wheelchairs. The game takes players into a virtual adventure through mythical environments inspired by South American landscapes. Players can move themselves through the environment by performing exercises. For example, players doing one exercise can hoist buckets of water to be dumped into a cistern that can be emptied to propel a boat. The exercises are adapted from an exercise protocol developed at the Ranchos Los Amigos National Rehabilitation Center in California. A video of Skyfarer in action is available on YouTube (https://youtu.be/feSXIdOQjtA). Skyfarer is designed to help people gain strength and prevent pain in a way that eliminates the boredom and monotony of many exercise routines, Jordan-Marsh says. Shoulder pain and lack of upper-body strength often force users of manual wheelchairs to move to using electric wheelchairs, she says. But electric wheelchairs come with many disadvantages, including cost and the need for a van or large car to transport them. The game is exciting for social work in particular because it helps wheelchair users combat the isolation that often comes with having a disability, Jordan-Marsh says. The interactive and virtual format of the game encourages other people such as caregivers to watch and even play along. Skyfarer has attracted the attention of physical therapists who are interested in combining exercise with gaming technology. The development team is working on adding exercises to the game, and some physical therapists want to expand its use to include people who are not in wheelchairs. "We think it has really great potential for increasing the fun that individuals can have together in exercise," Jordan-Marsh says. Fagundo, A.B., Santamaria, J.J., Forcano, L., Giner-Bartolome, C., Jimenez-Murcia, S., Sanchez, I., et al. (2013). Video game therapy for emotional regulation and impulsivity control in a series of treated cases with bulimia nervosa. European Eating Disorders Review, 21(6), 493-499. Freddolino, P.P., & Blaschke, C.M. (2008). Therapeutic applications of online gaming. Journal of Technology in Human Services, 26(2), 423-446. Granic, I., Lobel, A., & Engels, R.C.M.E. (2014). The benefits of playing video games. American Psychologist, 69(1), 66-78. Steadman, J., Boska, C., Lee, C., Lim, X., & Nichols, N. (2014). Using popular commercial video games in therapy with children and adolescents. Journal of Technology in Human Services, 32(3), 201-219. Wilkinson, N., Ang, R.P., & Goh, D.H. (2008). Online video game therapy for mental health concerns: A review. International Journal of Social Psychiatry, 54(4), 370-382.